Cedar Rock Chalet is the place to be when you want to get away from it all! 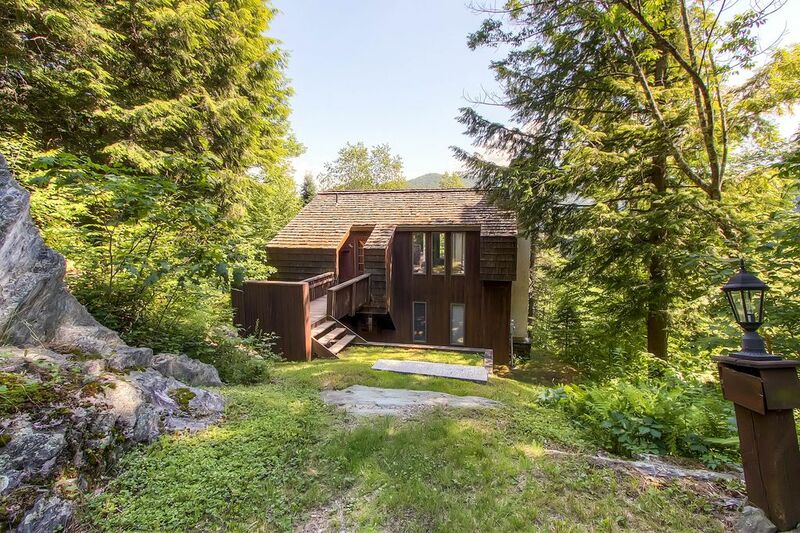 Located in the small Vermont town of Stockbridge, just 15 minutes drive to Killington. Cedar Rock boasts breathtaking views, seen right from the tranquil seclusion of your own vacation home. The main level of the home as an open floor plan and features a large fieldstone fireplace in the living room with queen sofa sleeper, 42-inch flat screen satellite TV, DVD, Wi-Fi, there is also movies games and books to keep you entertained, we do provide a landline phone as cell service at the house is spotty. Full kitchen and dining area, sliders doors that lead out to the deck with gas grill. The master bedroom has a 20-inches TV with DVD player, slider doors that lead out to a private deck. The second bedroom has a queen and a single and the third bedroom has a set of built-in twin bunk beds are all the lower level. There is one full bathroom with tub/shower combo and the other with a stand-up shower and a washer and dryer available for your uses. After a long day of activates why not relax in the outdoor hot tub all while enjoying moon lite sky and the sounds of the great outdoors. There are so many recreational opportunities abound in our area! Enjoy downhill skiing in the winter, and mountain biking and the Adventure Center in the summer at Killington Resort. There is cross-country skiing, sleigh riding, ice skating, snowmobiling, and snowshoeing, or you can just relax by the roaring fireplace with a book and a glass of wine. Take a ride and enjoy the beauty of the Vermont countryside, drive past farms and rivers on your way down to the General Store for coffee and snacks. In the summer the river is the best place to be, and we have private river frontage just at the bottom of our road with hiking trails and tennis courts and a nice beach and swimming area. Try fishing, kayaking, or swimming; or you might want to visit the Stockbridge yacht club and be brought up the river and dropped off to float down on a tube with your family and friends, a great way to cool off! Make sure to look through our Welcome Tablet for many more things to do and see. Pets are considered and if approved a pet fee of $50 per pet will be applied to the reservation. *** Note about the property…This is property is at the end of the road in the mountain, located in the River Bend Community, we highly recommend all wheel/4-wheel drive during the winter month as the driveway is steep. A lot of Vermont small towns have very spotty cell services, this may affect your GPS devices, so please make sure you print out your directions before you leave home. Book a Cozy, Welcoming Killington Vacation Rental in Minutes Aside from picking your destination (Killington, of course! ), choosing a vacation rental is the biggest decision you'll make when planning your trip. You'll spend more money on your accommodations than you will on any other travel expense, and where you stay will set the tone for your whole experience. Unfortunately, choosing a vacation rental isn't always easy. Unless you're a repeat guest, you'll have to book it sight unseen and trust that the photos and description match the reality. You may also have to contend with pesky hidden fees, and you're often on your own if any questions arise during your stay. Wouldn't it be wonderful if you could get all the perks of a vacation rental—the space, the privacy, and the low per-person price—with the security and simplicity of a traditional hotel or resort?Enjoy Peace of Mind—Choose Killington's Premier Vacation Rental Company Our portfolio includes some of the most desirable vacation rentals in Killington, and there's something for every taste—whether you prefer an adorable barn-style home that's off the beaten path or a chic condo with all the amenities of a luxury resort. But GetAway Vacations offers more than a place to store your skis and get some zzz's. We're here for our guests 24 hours a day, seven days a week, and we're pleased to share our local expertise with you. If you want dining recommendations or are debating what to do the following day, simply call us. We've seen and done it all, and we'll make sure you experience the very best of Killington. We also strive to be as transparent as possible, so you know exactly what to expect before you book your vacation rental. Our rates include all taxes and fees, and you'll find pictures of your rental from virtually every angle on our website. We want you to feel 100 percent comfortable—now and when you arrive. So go ahead, browse our available vacation rentals. Then give us a call to book your stay. It's sure to be your most relaxing and enjoyable vacation yet! This place is great if you like mice infestation!! And if you don't want any control over the heat from room to room. Other than that, well you get the idea. We were there no sooner than 10 minutes and as my wife was sitting at the kitchen a mouse ran right past her toward the refrigerator. We contacted the owner and were directed to a locked closet that all sorts of mice catching paraphanelia and were directed to do it ourselves. We caught 3 more within a day or so. Who knows how many more there were and what they were doing while slept. Also while obvious in the pictures, note there is no dining space. There is a small table (two people at best) in the kitchen. This place is really not big enough for more than 3 maybe 4 people. We would like to apologize that you and your guest experienced this while staying at Cedar Rock Chalet this past November. We have had several reservations before yours and did not have any complaints of any mice. Here in the mountains of Vermont during certain times of the year will experience issues like this, and when it does happen we take action on getting rid of them. We did have a professional exterminator go in treat the home and have not any had more issues since then. We were 8 guys and each of us has some good reasons to remember this place. The chalet was awesome and a perfect home away from home. We went to Killington for Mountain biking/horse riding & other adventure sports. We also drove to MA for river rafting. All in all, a wonderful place to hang out.